To think, that beer would only cost $3 in Belgium! 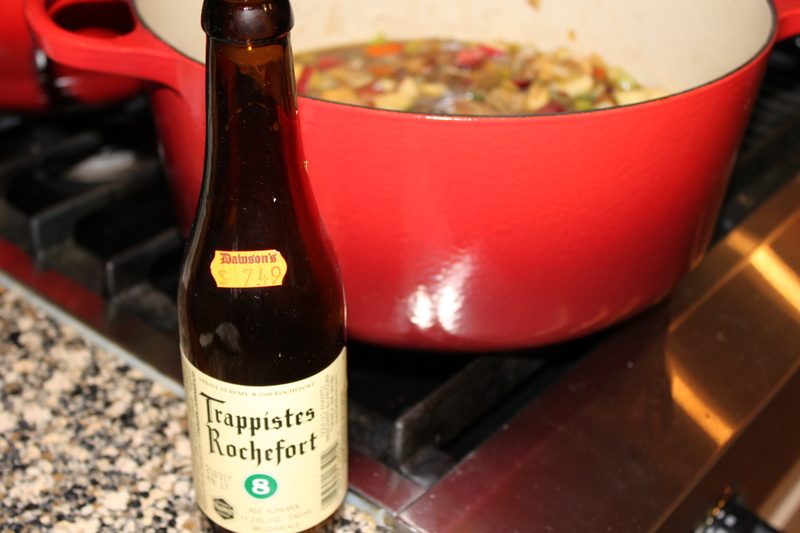 This is our FOURTH attempt to recreate the Rochefort Beer Stew we enjoyed on our Le Tour De Trappe in Rochefort, Belgium. You can view our first attempt here, second attempt here, and third attempt here. We combined the vegetables and texture of the first dish with the fruity sweetness of the second dish, and the roasty chicory flavor of the third dish. We give you Chicory Chicken Waterzooi. All in all, we came very close and this is by far the most delicious version! It lacks the sweetness of the original, but we may be able to remedy that in future versions by adding more apple and cherry. Or, we were so delirious after biking 50 ungodly hilly miles that the restaurant really served us dog turd stew and our minds transformed it into something magical and delicious. I guess we’ll never really know for sure. 2. Melt 2 TBSPs butter in Dutch Oven or large pot. 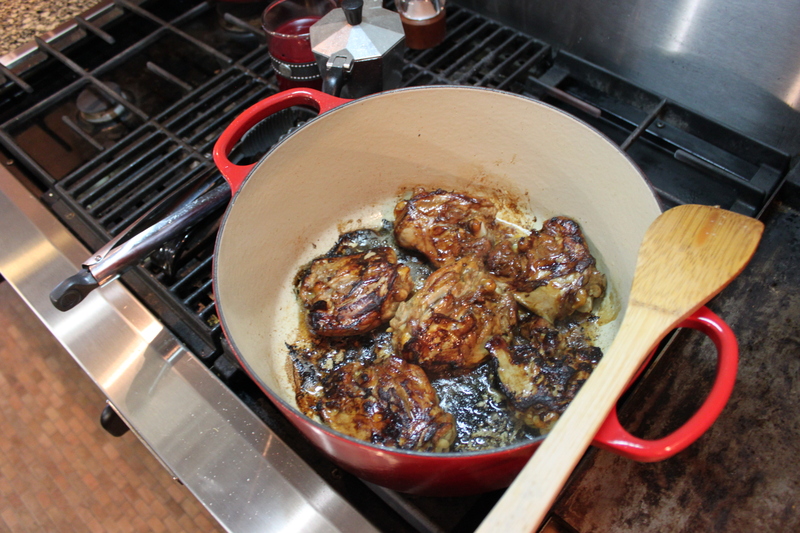 Remove chicken from marinade, and reserve 2 TBSPs of chicory marinade. Salt and Pepper Chicken Thighs and Sautee on Med to Med High until brown on both sides (approx 3-5 minutes each side). I forgot to flour the chicken and it burnt a smidge. Woops! 3. Remove chicken, and in same pot, add 1 TBSP butter. 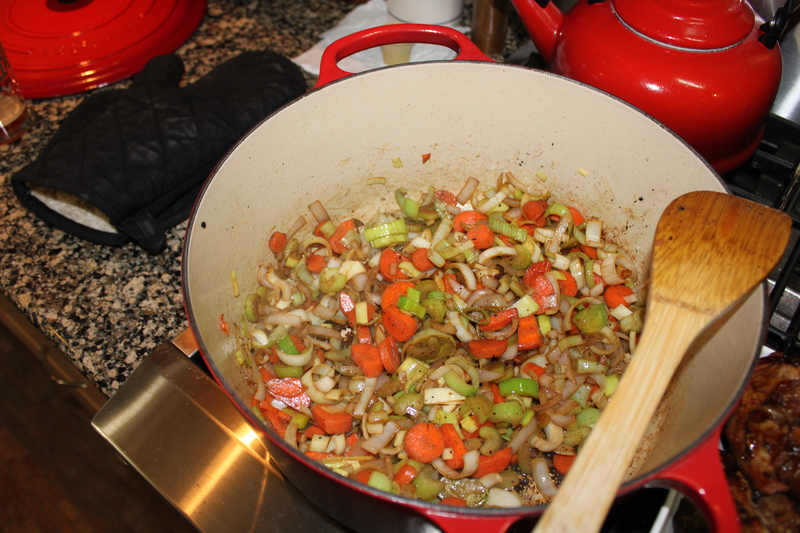 Sautee leeks, shallots, carrots, and celery. Before veggies become tender, add Garlic and Mushrooms (approx 5 minutes). Cook Mushrooms and Veggies until tender (approx 5 minutes more). 4. Add 1 Bottle of Beer to deglaze bottom of the pot. 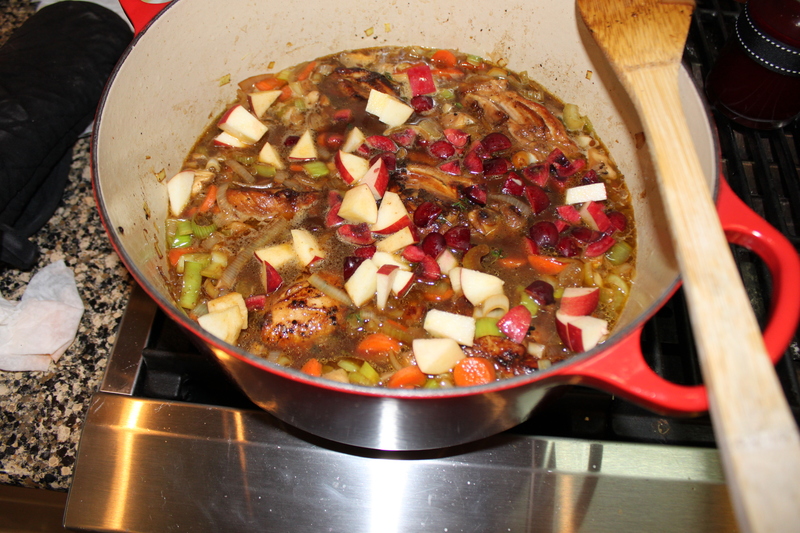 Then add stock, 2 TBSPs marinade, Thyme, Bay Leaf, Cloves, Apples, Cherries, and Chicken. Bring to a boil and simmer covered on low for 1 hour. Now with more beer and fruit! 5. Remove chicken from pot, remove meat from the bone and add back to liquid. 6. 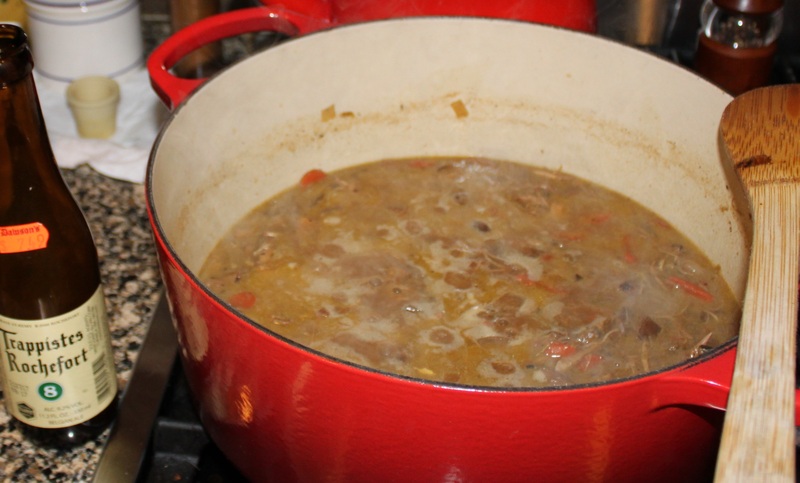 Turn down or turn off heat to the pot until the liquid has stopped simmering. Separately, mix eggs, cream, and butter until well combined (be careful not to curdle eggs or cream with hot butter). Slowly add the egg/cream/butter mixture to the stew…again, you don’t want it to curdle. Be sure to stir the stew as you add the mixture. 7. Cook stew on low for 10 minutes. Serve with crusty French Bread!